Losing Hair after Pregnancy? So am I! I looked in the mirror a second ago and realized my edges are NOT on fleek right now! I’ve been getting plenty nutrients and enough water so I know there’s only ONE culprit – hormones. Those sneaky little thieves are running rampant and they’re taking our hair with them! What a trick the Most High plays on women! Our bodies are programmed to hold onto our hair during pregnancy; so we get these long, beautiful, THICK locks and just like that your bathroom sink starts to look like you shaved chewbacca! How am I going to fix this? I don’t know but I know it WILL get fixed. Our hair is our crown ladies! We can’t just let it go like that. I need to at least be able to say I fought the good fight. From all my research on the topic it seems like it’s a very temporary problem. Unfortunately, I don’t want to wait 6-12 months to have my edges back in order! So I’m trying everything. My go-to right now is Grow Me Crazy by AllThings Hair. It’s all natural, cooling and smooth. I’ll let y’all know how this works out for me. Cosmetology taught me that short cuts create a thicker, fuller look so if you’re in a pinch already with time and energy management after baby, go for it. I promised Hubz I wouldn’t chop again so I’m sticking to my word…but if I hadn’t, I’d go for a chic pixie right about now! 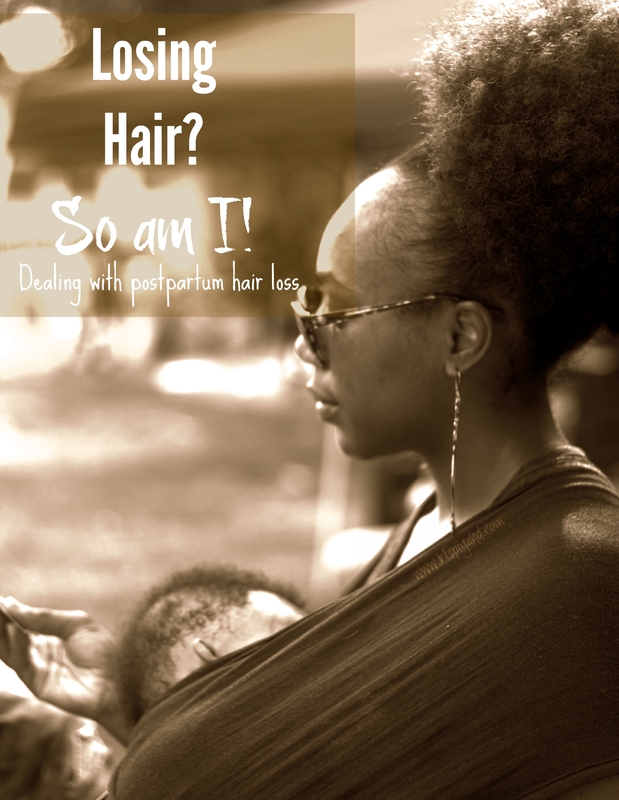 I know there’s some fab naturalistas reading this, so PUH-LEEZ comment below with any suggestions! My hair is counting on y’all!